Gultharia or the Indian Wintergreen is aboriginal to India and have amazing therapeutic properties in its kitty just like it’s sibling, the American Wintergreen also known as Gaultheria procumbens. 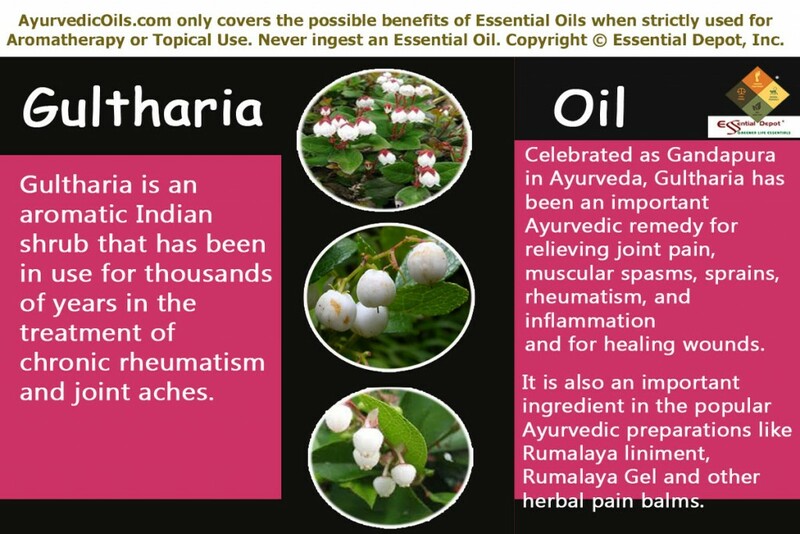 Scientifically called as Gaultheria fragrantissim, Gultharia is an aromatic Indian shrub that has been in use for thousands of years in the treatment of chronic rheumatism and joint aches. Celebrated as Gandapura in Ayurveda, Gultharia has been an important Ayurvedic remedy for relieving joint pain, muscular spasms, sprains, rheumatism, inflammation and for healing wounds. It is for all these healing values, Gultharia and its essential oil, steam distilled from its leaves are used as an important ingredient in the popular Ayurvedic preparations like Rumalaya liniment, Rumalaya Gel and other herbal pain balms. Indian Wintergreen has a unique healing aroma for which it is also known as Fragrant Wintergreen, is found growing in the sacred lands of the holy Himalayas from Uttarakhand to Myanmar and South Eastern Tibet. It is a member of the Rhododendron plant family, Ericaceae. Gultharia grows at an altitude of 1500 to 2700 m and bears dark-violet blue berries that attract the attention of birds and numerous insects towards it. It is a known fact that the Indians of America were the first to identify the medicinal powers of Wintergreen in America and this was mainly due to the use of the Indian Wintergreen, which has been in use in the world’s oldest healing system on earth, Ayurveda before 5,000 years in India. The ancient Indians used the leaves of Gultharia herb in brewing tea for fighting against rheumatism, joint pain, toothache and other painful conditions. These remedial leaves were also ground and used in poultices for relieving muscular aches, stiff joints and headache. It was later traced in 1800s that the pain-relieving qualities of Wintergreen plant was mainly due to the aspirin-like qualities present in these aromatic leaves helping in relieving pain in a jiffy, naturally. Wintergreen leaves were used in making tea by the French explorers for assisting pain and this usage lead to the popular term ‘The du Canada’ means the ‘The tea of Canada’. The leaves of Gultharia plants were chewed by the traditional Indians as an aid for breathing during strenuous work, alleviating oral problems, freshening the breath and for treating back pain and joint aches. The leaves of Gultharia plant were used in folklore medicinal system for rheumatism, sore throat, colic, inflammation, tooth decay, skin disorders, cold and body pain. It is also used as a flavoring ingredient in toothpastes, chewing gums, herbal teas, candies and health beverages. These leaves have also been a part of pesticides and insect repellants. Methyl salicylate is the major chemical constituent comprising of about 98% of its essential oil and the other components are gaultherilene, limonene, a-pinene, delta-cadinene, delta-3-carene and myrcene. These constituents contribute to its healing properties like anti-rheumatic, anti-arthritic, anti-inflammatory, antiseptic, analgesic, antispasmodic, carminative, astringent, emmenagogue, diuretic and stimulant. Healing according to Ayurveda is not an external force and real healing should always happen from within, for which every individual should have a thorough knowledge about their health condition and their entire system. You will know it appropriately when I say that the word ‘Ayurveda’ actually means ‘the knowledge of life’. Ayurvedic healing aims at longevity through prevention of illnesses and healthy aging by following an Ayurvedic routine along with the use of herbs, essential oils and a balanced diet. The basic Ayurvedic principle revolves around the health of mind, body and soul. Every human being is unique according to the Ayurvedic theory with a unique individual constitution comprised of three biological energies known as doshas. They are vata, pitta and kapha dosha. Vata energy is responsible for respiration, movement and circulation of the body and controls the neurological imbalances and nervous impulses of the system. Pitta represents fire and is in charge of metabolic functions like digestion and absorption of essential nutrients by the body. Kapha dosha stands for water and is responsible for structure and sustenance of the body, imbalance of which can cause obesity and respiratory problems. Gultharia essential oil reduces kapha dosha and increases pitta and vata doshas. Pain is the worst enemy of mankind, be it a joint pain or a headache, it has the power to destruct your work and drop down your day. Aspirin is one among the best over-the-counter remedies for treating pain and inflammation. 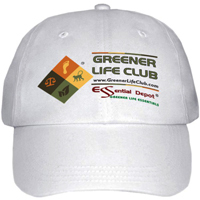 You’ll be surprised to know that the remedial power of aspirin is due to the presence of methyl salicylate and with a high proportion of this constituent, generally many varieties of Wintergreen essential oil is used in various pain relievers in the market. The pain-relieving quality of Gultharia essential oil is due its analgesic, anodyne and anti-inflammatory properties. Massage the painful area with 2 drops of Gultharia oil blended with 1 ml of coconut oil for relieving pain and reducing inflammation. This remedial massage relieves pain by causing numbness on the painful area, boosts blood circulation, hinders the secretion of prostaglandin compounds that sensitize the spinal neurons to pain and promote peaceful sleep. You can also add 2 to 3 drops of Gultharia oil in hot or cold compress or in warm bathing water for reducing pain and inflammation. Improper digestion is the primary reason for all the major illnesses in Ayurveda. Pitta energy is responsible for the digestive fire known as agni, which supports metabolic functions like digestion of food, absorption of essential nutrients and excretion of waste materials from the body. Sluggish digestion occurs when there is an imbalance of pitta energy due to changes in the diet, lifestyle and emotional constitution of an individual. Gultharia essential oil has the power to aggravate pitta dosha and acts as an excellent carminative, stimulant and diuretic. Massaging your stomach and abdomen with 2 drops of Gultharia oil mixed with 1 ml olive oil helps in eliminating the formation of gas, supports constipation, flatulence, promote the secretion of bile and other digestive juices and discharges excess salt, uric acid and toxic remains of undigested food through urine. Inhaling the aroma of this oil by adding 1 drop of Gultharia oil to your diffuser or vaporizer helps in stimulating the secretion of digestive juices assisting in regular digestion. Gultharia essential oil has natural diuretic properties that promote sweating and frequent urination. By this way, it helps in flushing out the harmful toxins like uric acid, excess salt, water and fat from the body. Massaging your body with 6 drops of Gultharia essential oil blended with 4 ml olive oil can assist in treating water logging, obesity, edema, kidney stones, urinary infections and hypertension caused due to the accumulation of fat, water, uric acid and other toxins left behind due to improper digestion. Adding 3 to 4 drops of Gultharia oil in bathing water is also a great idea for getting rid of such toxic substances. Rheumatism and arthritis mainly occur due to the accumulation of toxic substances in the body due to poor digestion and problems in the colon, that paves way for the toxins to reach the joints causing pain, lack of circulation, swelling and inflammation. According to Ravi Bhanot, a popular Ayurvedic Researcher at the Ayurveda Institute of Europe, the best way to treat gout and rheumatic problems is to use medicated oil for massage that is made up of Wintergreen essential oil and menthol. Gently massaging the affected parts with 4 drops of Gultharia oil with 2ml of sesame oil aids in triggering digestion, promoting the flow of urine through which the toxic substances are eliminated, warms up the muscles, stimulate blood circulation, and reduces pain and inflammation. This way, the Indian Wintergreen essential oil acts as a boon to arthritis and rheumatic patients who suffer from pain, swollen muscles, inflamed joints and poor blood circulation. Gultharia essential oil is a proven emmenagogue that can be of great aid in assisting female problems like menstrual discomforts and menopausal symptoms. Massaging your lower abdomen with 3 drops of Gultharia oil blended with 1.5 ml of warm sesame oil can help in promoting delayed or blocked menstruation, lessen menstrual pain, reduce spasms, and treat nausea, fatigue, sleeplessness, tension and urinary problems associated with menses. It can also help in reducing hot flashes and mood fluctuations in menopausal women by stimulating blood circulation and strengthening the uterine walls. Adding 2 drops of Gultharia oil in warm bath before going to bed and 1 drop added to your room diffuser at night can calm the tensed muscles and promote peaceful sleep at night. Respiratory problems are mainly caused due to excess of kapha energy. With its power to lessen kapha dosha, Gultharia essential oil can effectively act upon reducing chest congestion, spasmodic coughs, breathing difficulties, asthma and nervous afflictions. Adding 2 drops of this oil in steam inhalation can help you in eliminating excess phlegm and mucous deposits through urine and excreta. With its anti-spasmodic properties, Gultharia essential oil is also effective in treating spasms in the intestine, muscles, nervous system, respiratory system and circulatory system. Gultharia essential oil is an efficacious natural remedy for healing wounds with its antiseptic properties. This oil is also known for its ability to enhance spiritual power, logical thinking, and reasoning skills and accentuate the harmony of the soul with the divine power. It is for this reason; the ancient saints used the leaves of the Indian Wintergreen plant during sacred ceremonies, special chants and meditations. This article is only for the purpose of information and is not meant to diagnose or substitute professional advice or prescribed medication. 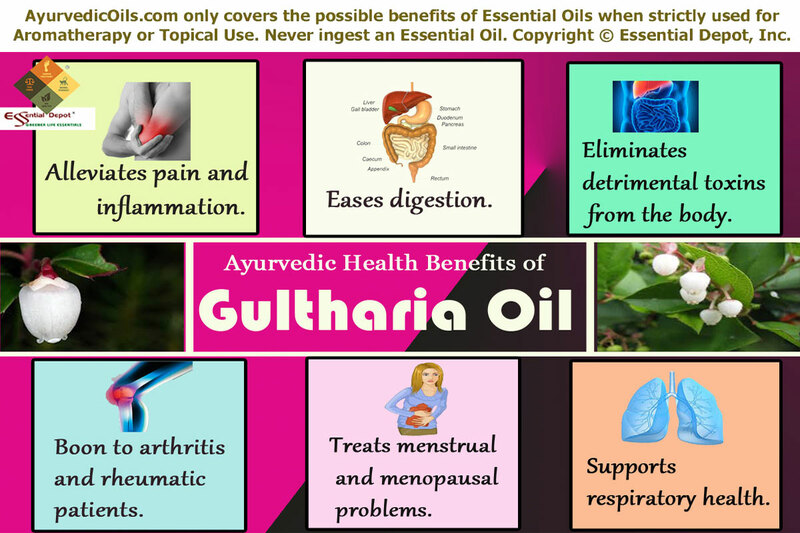 Gultharia essential oil has a high proportion of methyl salicylate, which is a main ingredient in aspirin and is considered toxic in excess for internal usage. Never use Gultharia essential oil internally and always ensure that you use this oil in a diluted form for topical application. Keep it away from children and please consult your Healthcare practitioner before using Gultharia essential oil if you are pregnant, nursing or allergic to aspirin. 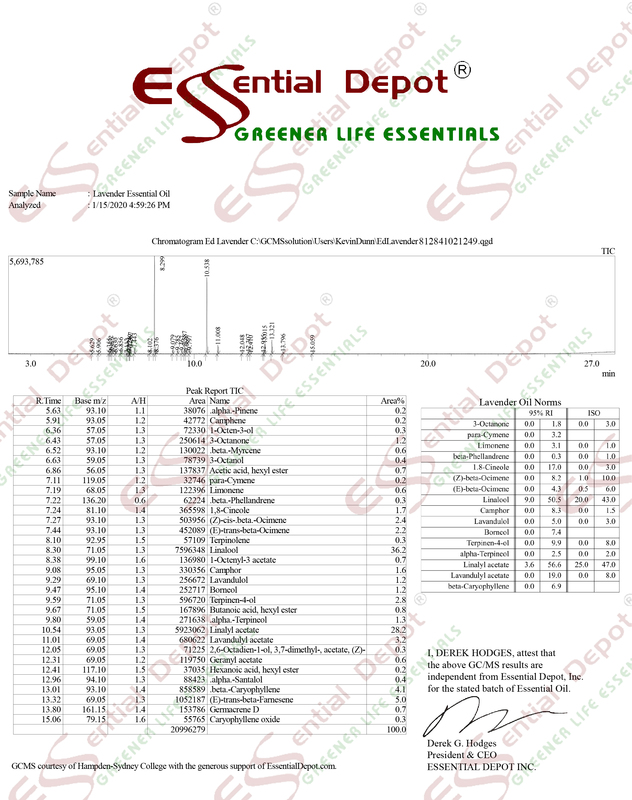 Always consult your Ayurvedic professional before using the right essential oil for your unique health condition and individual constitution.